The Theatre Royal, Covent Garden, was completely destroyed by fire in the early hours of the morning of 20 September 1808. Miss Mellon, who was a great coward respecting fire, was almost out of her senses at the proximity of the flames to her house in Little Russell Street. But when a report arrived that several walls had fallen in and buried a number of poor creatures, her whole anxiety was for their rescue from their dreadful sufferings, if still alive. Accordingly, with her usual promptitude, she took every measure to aid the great cause of humanity. The compiler of these volumes, on the evening after the fire, when returning home from school under charge of one of her father’s servants, begged hard to be taken to see the ruins. 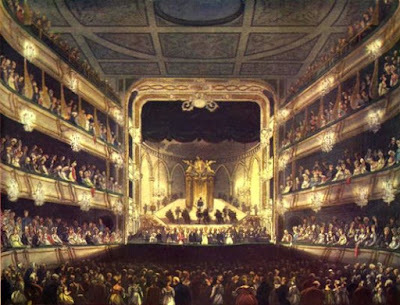 The crowd was alarming; and the servant carried her as near as was practicable, which was to the theatrical book-seller's shop, nearly opposite, which is still kept there. Many workmen were engaged in digging out the bodies of the unfortunate persons who were buried under the ruins; and they worked by torchlight at their sad occupation. At the door of the bookseller's shop was placed a large barrel of ale, ordered by Miss Mellon, from which the labourers were supplied by her directions. In the drawing-room window above stood Miss Mellon herself, all anxiety, earnestly urging the men to proceed, and offering five pounds for each of those who were brought out alive, and two pounds for each body of the hapless creatures who perished. She was dressed in a blue satin pelisse, looking lovely in her anxiety; and each time she appeared at the window she was received with animated cheers by the crowd, who seemed ready to worship her. The loss of property was estimated at £150,000 of which only £50,000 was covered by insurance. Not only the building, but all its contents were destroyed. This included the organ bequeathed to the theatre by Handel and many pages of unpublished manuscript music. All the scenery, costumes, musical and dramatic libraries were lost. In addition, the wines of the famous Beefsteak Club which were stored there were destroyed. It was a particular blow to the Kemble family. John Kemble, part-owner and manager, was ruined. He had invested everything and more in the theatre and had not repaid what he had borrowed. But Kemble was fortunate in his patrons, who were eager to provide him with the resources to rebuild the theatre. George, Prince of Wales, gave Kemble £1,000 and the Duke of Northumberland gave him £10,000, refusing to make it a loan. Kemble’s sister, the great tragedienne Sarah Siddons, lost her entire wardrobe – the costumes and jewellery that she had collected over her long career, including the French Queen’s veil which was worth £1,000 alone. Extra funds were raised by issuing subscription shares of £500 each and work was soon underway to rebuild the theatre. 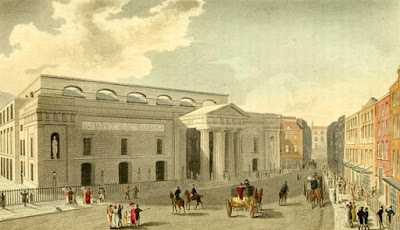 George, Prince of Wales, laid the foundation stone on 31 December 1808, and within ten months, the new theatre was finished. The new Theatre Royal, Covent Garden, opened on 18 September 1809. 1. 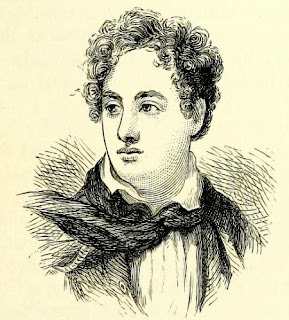 From Campbell, Thomas, Life of Mrs Siddons (1834). 2. From Ackermann, Rudolph and Combe, William, The Microcosm of London or London in miniature Volume 3 (Rudolph Ackermann 1808-1810, reprinted 1904). 3. From Campbell, Thomas, Life of Mrs Siddons (1834). 4. Feltham, John, The Picture of London for 1818 (1818). 5. Walford, Edward, Old and New London: A narrative of its history, its people, and its places (Cassell, Petter & Galpin, 1873, London) Vol 3. 6. From Campbell, Thomas, Life of Mrs Siddons (1834). 7. From Wilson, Mrs Cornwell Baron, Memoirs of Miss Mellon, afterwards Duchess of St Albans new edition Vol 1 (1886). 8. From The Gentleman’s Magazine (1809). 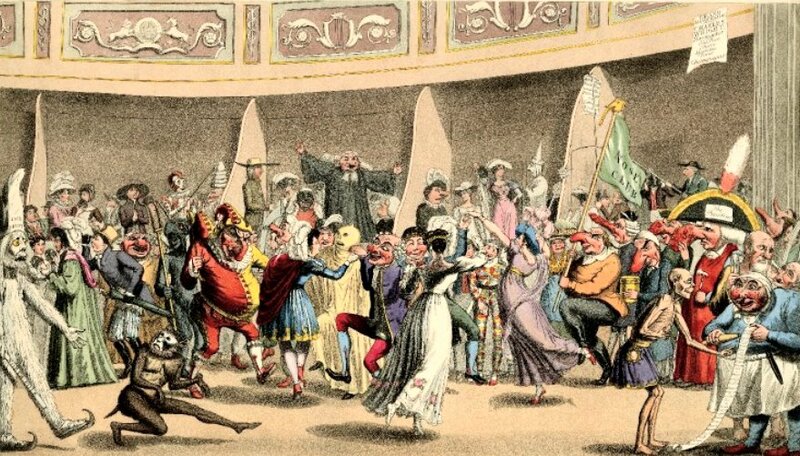 The Argyll Rooms1 were a fashionable venue for concerts, masquerades and other entertainments, from 1806 when they were set up by Colonel Greville, until the second building burnt down in 1830. The Argyll Rooms were originally part of the house of John Campbell, 2nd Duke of Argyll. Some of the Duke’s house was demolished to make way for Little Argyll Street and the north wing was later bought by Lieutenant Colonel Henry Francis Greville for the sum of £70. 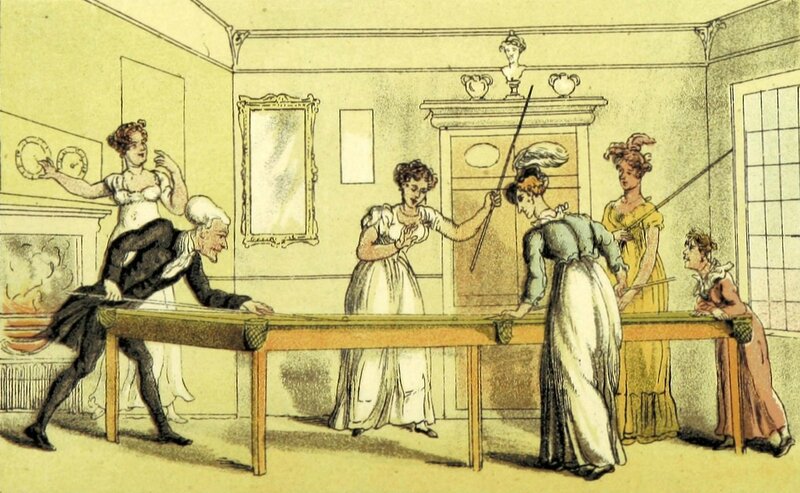 By means of borrowed money and subscriptions, Greville refurbished and transformed the house and opened it as The Fashionable Institution in 1806. 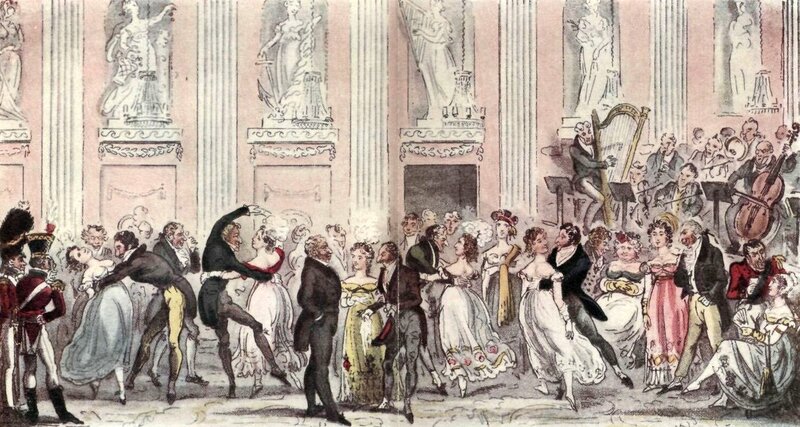 In 1807 and 1808, Greville was granted an annual licence by the Lord Chamberlain for dancing, burlettas and dramatic performances, but from 1809, the licence was limited to music and dancing with occasional permission for masked balls. By 1811, Greville was in serious financial difficulties and the following year he went abroad. By this time, his associate Stephen Slade, a glass and china dealer, was already running the rooms and Slade became the owner in 1813. Slade ran the Argyll Rooms until 1819 when they were compulsorily purchased due to John Nash’s redevelopment of Regent Street. Slade received £22,750 in compensation. What were the Argyll Rooms like? The fanciful elegance with which the internal parts of this building are fitted up, reflects the highest credit on the taste of Colonel Greville, the founder of the institution, from whose design, and under whose direction, the whole has been executed. From the following description, some idea may be formed of the general effect. The entrance and lobbies are ornamented with Corinthian pillars, and illuminated with gilt lamps. On the ground floor are three spacious supper rooms; the first of which is of a grey colour, hung with scarlet drapery; the paper of the second, is a stone-colour and green trellis, and the drapery is a rich salmon colour, lined with pea-green; the third, though not so superb as the former, is fitted up in a corresponding style, and the whole are brilliantly illuminated, with glass and gilt lamps and chandeliers. The grand saloon, which is employed both for the purpose of theatrical representation, and as a ball room, is of an oblong form with elliptical terminations. On each side, and over the entrance, are three tiers of boxes, amounting in the whole to about four and twenty. The first range above the ground tier, is ornamented with elegant antique bass reliefs in bronze; the upper tier is of aetherial blue, decorated with scrolls in stone colour, and both are inclosed with rich gold mouldings. Over each box, is a beautiful circular bronze chandelier, with cut glass pendants; the draperies are of scarlet, and the supporters between the boxes represent the Roman ox, and fasces in bronze and gold. At the opposite end are the orchestra and stage, over which is the following appropriate motto, “Sollicitae jucunda oblivia vitae.” The walls of the middle space, which is of an ample size, are superbly ornamented with ranges of Corinthian pillars, representing porphyry, with capitals of gold. On the intermediate pannels, which are surrounded with borders of blue and gold, are bass reliefs, in stone colour, as large as life, the subjects of which are admirably adapted to the purpose for which they are employed. On each side of this magnificent room, are tiers of benches, covered with scarlet, over which are suspended eight superb glass chandeliers, and the whole internal space is marked out with chalk, in the most fanciful manner. Contiguous to this are a refectory, painted with landscapes and wreathes of flowers, and a billiard-room, fitted up with singular neatness. On the other side, is a spacious chamber appropriated to cards, the ceiling of which is richly painted, and the windows are hung with scarlet drapery. 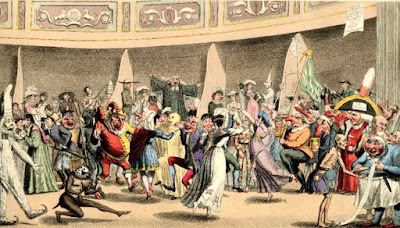 Masquerades became a regular feature of the Argyll Rooms. 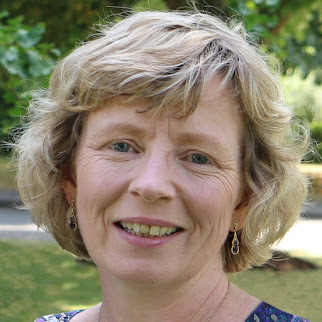 The subscription masquerades were tightly governed, with extra tickets only being offered to those who met with the approval of the lady patronesses, or at the very least, the recommendation of a subscriber who took responsibility for their respectability. This suggests an exclusivity that was akin to that of Almack’s Assembly Rooms. Robert Cruikshank’s illustration of The Cyprian’s Ball is shown at the top of this page. 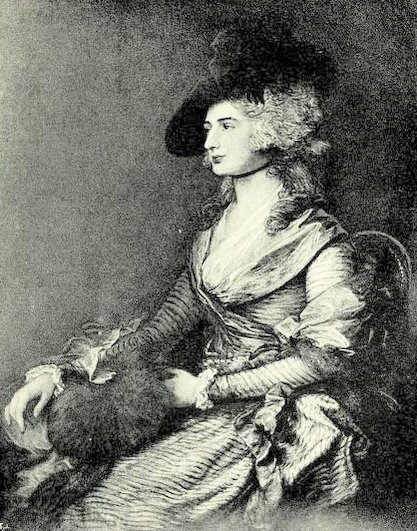 Sarah Siddons was the most famous tragic actress of her time. She was widely acclaimed for her roles in Shakespearian plays, particularly as Lady Macbeth. I chose her as one of my twelve women in What Regency Women Did For Us because of her role in helping to make acting a respectable profession for women. In the seasons following her retirement from the stage in 1812, Sarah Siddons gave some public readings from Shakespeare and Milton at the Argyll Rooms. The size of the venue was ideal for the performances, allowing the audience to see and appreciate all of Sarah Siddons’s wonderful facial expressions and the readings proved very popular. The Argyll Rooms were a popular venue for concerts and lectures. On 8 March 1813, the newly formed Philharmonic Society gave its first concert at the Argyll Rooms. They continued to perform at the Argyll Rooms until 1830. 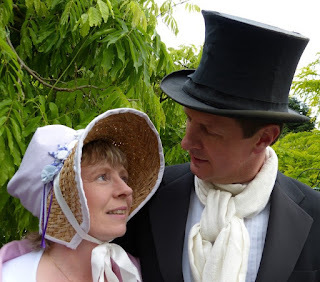 Of vice and folly, Greville and Argyle! The Arbiter of pleasure and of play! Champaign, dice, music, or your neighbour’s spouse. Talk not to us, ye starving sons of trade! Appears the beggar which his grandsire was. Now round the room the circling dow’gers sweep. These after husbands wing their eager flight. The Argyll Rooms were acquired by the New Street Commissioners in 1819 and the Regent’s Harmonic Institution (later the Royal Harmonic Institution) became the new tenants. 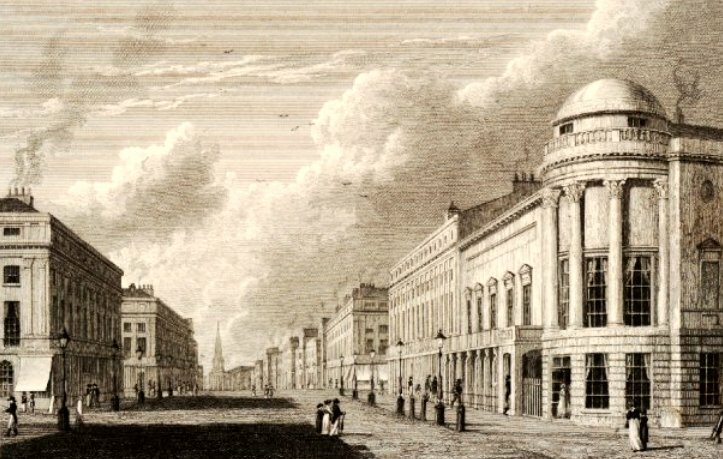 The rooms were rebuilt on the east side of Regent Street according to Nash’s design. The new rooms were destroyed by fire on 6 February 1830. Although rebuilt, the Philharmonic Society moved to new premises and the venue was turned into shops and eventually replaced by Dickins & Jones in 1919. (1) Sometimes spelt Argyle Rooms. (2) From Walford, Edward, Old and New London: A narrative of its history, its people, and its places (Cassell, Petter & Galpin, 1873, London) Vol 4. (3) From Feltham, John, The Picture of London for 1809 (1809). (4) The Times, 4 June 1806 from The Times Digital Archive. (5) The Times 16 April 1807 from The Times Digital Archive. (6) The Times 3 June 1813 from The Times Digital Archive. (7) The Times 31 May 1810 from The Times Digital Archive. (8) The Times 22 June 1811 from The Times Digital Archive. (9) From Blackmantle, Bernard, The English Spy, illustrated by Robert Cruikshank (1825). (10) The Times 20 July 1807 from The Times Digital Archive. (11) The Times 10 June 1807 from The Times Digital Archive. (12) From Byron, Lord, English Bards, and Scotch Reviewers; a satire (3rd edition 1810). (13) From Leigh, Samuel, Leigh's New Picture of London (1827). Blackmantle, Bernard, The English Spy, illustrated by Robert Cruikshank (1825). 'Argyll Street Area', in Survey of London: Volumes 31 and 32, St James Westminster, Part 2, ed. F H W Sheppard (London, 1963), pp. 284-307. British History Online [accessed 8 June 2017].